Yes we do! We actually have one of the best affiliate programs in the industry: monthly recurring commissions starting at 25% and increased based on performance. You can sign up here, and start earning money immediately! Why use One Hour Indexing? Google uses backlinks as the single most important factor in ranking your site. If Google feels your backlink is important, it adds it to the search index. And if you have a lot of important (AKA indexed) links, your site goes up in the rankings. Why is indexing important? Do my links need to be indexed to help me rank in Google? This is one of the most common questions we get and it has a complicated answer. Google has many "indexes" that it uses to deliver search results. These include video, news, QDF (query deserves freshness), cached, and what is commonly called the index. As we learned with another of our services, Linklicious, indexing is not required to rank. But like was covered in the previous question, an indexed link is worth more than an unindexed one. So as an SEO, if you have the choice to make - indexed or unindexed - it should be easy. Indexed links will improve your SERPs much faster and safer than unindexed links. Will One Hour Indexing work on all types of links? Yes, this service will work on every single link type. This includes links that you're building AND the links on your money site! Does indexing really only take an hour?! Yes! Indexing actually starts immediately as we process each of your links individually. It can take an hour or two for us to complete the entire indexing process, but you'll see MASSIVE improvements an hour after the links are processed and even more MASSIVE results a day later. Once links are added to the system we're unable to stop the process, so be careful to only load in what you want indexed! Will this sandbox my website? Nope! We only use a Google-approved method for link processing and indexing, and haven't seen a single case of sandboxing or a penalty from using this service. That said, don't be a SEO that builds 10,000 links a day to your money site, indexes them, and earns a quick penalty. You still have to use common sense when link building, and follow best practice SEO techniques. How is this service different than Linklicious? Great question! Both services serve the same goal - make Google find your links and ultimately improve your ranking in the SERPs. One Hour Indexing works with the single goal of getting your backlinks indexed in Google. It uses unique and Google-approved methods for getting your links added to the Google index FAST, safely, and as permanently as every other type of page that gets added. Linklicious, on the other hand, has the foundation of link awareness. It makes sure Google (and AHREFs and Majestic) know about your links, and forces crawls and knowledge of your backlinks. It improves indexing, but the primary goal is cost effective ranking improvements. Since both services use different approaches and have slightly different goals, they can be used together for maximum effectiveness. If you have just a few links you're building or you just want your primary site pages indexed, this service would probably be more appropriate. Do you have an API to integrate with link building tools and services? YES! The entire goal of this service is to boost up your backlinks as easily and quickly as possible, so integrating with others automates it for you. 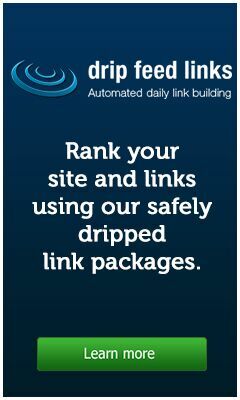 We integrate with many of the top link builders including DripFeedLinks.co, Dripable, Backlinks Genie, and others. If you have a tool or run a service that you'd like us to integrate with, check out our #DEVELOPERS# section for the API documentation. How long will my links last? For all of our accounts, we keep links for a minimum of 30 days after the drip is completed. Because of the way the site works with Google, there is no need to keep them longer. It is very dangerous to build a large amount of links to your site at once, and if you do you run a big risk of hitting the Google Sandbox. To help maximize results and minimize the chance of getting dinged by Google, we allow you to specify exactly how fast Google learns about your links. You can set up links to drip out 10 links a day or 1000 -you have total flexibility. We default it to a low and safe value. Note that every time you submit new links, they drip out at the same time as the previous submissions (in parallel). So if you add 100 links one day and 200 links the next day, they'll both be dripping out links every day. We are completely confident that this service will dramatically improve indexing across just about all link types. We do this using both Google-approved methods as well as a little "cloud magic" that let's Google know about your links AND shows it that your links are important enough to be indexed. Since we're so confident in our service, if you find that your indexing isn't going up, shoot us an email so we can figure it out together. If we can't improve your indexing, we'll give you your money back for that month. Typically poor indexing rate is due to links being invalid, links being on a sandboxed/deindexed site, or links being very low quality. If you submit garbage, Google is smart enough to figure it out. So build normal/good/valid links and watch the rankings and traffic go up!